This easy sausage and quinoa bake is a healthier version of the traditional sausage and peppers. Sausage and peppers was a go-to family meal in our house growing up. 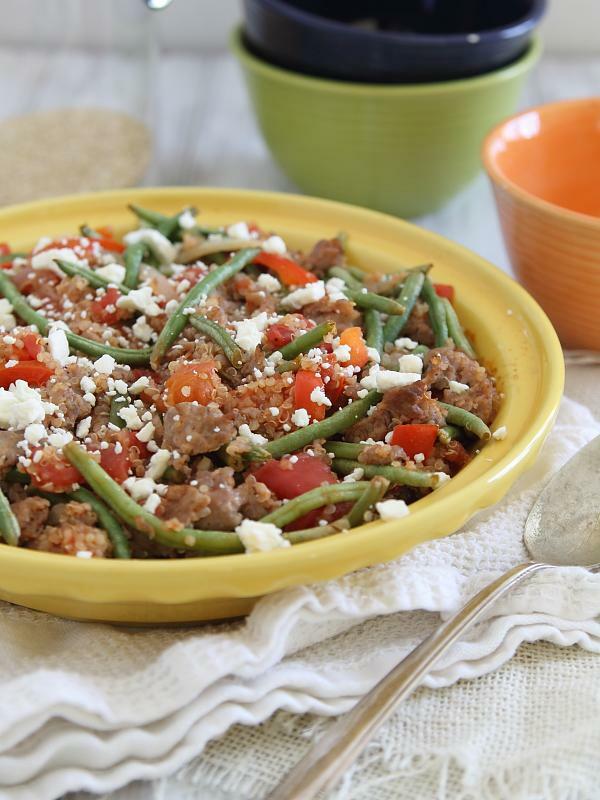 This easy bake takes the idea and puts a healthier spin on it by loading it up with protein-packed quinoa and throwing some extra vegetables in the mix with some green beans. Not a green bean fan? You can pretty much substitute any frozen vegetable. Broccoli, cauliflower and peas would all be great alternatives. In a large sauce pot over medium-high heat, cook the sausage for 5-7 minutes until no longer pink, breaking it into small pieces with a wooden spoon or spatula. Transfer to a dish and set aside. Add the olive oil to the pot, then add the red peppers, onion, salt and pepper and red pepper flakes. Cook for 5 minutes until the vegetables are softened. Add the garlic and cook for 30 seconds until fragrant. Add the diced tomatoes and tomato paste, stir to combine and coat everything with the paste. Reduce heat to medium-low and cook for about 5 minutes. Add the frozen green beans, toss together with the mixture and cook another 3-5 minutes, stirring occasionally. Return the sausage to the pot and add the cooked quinoa. Toss to combine and transfer to a baking dish. Cover with foil and bake in a 350 degree F oven for 15 minutes. Remove from the oven, top with crumbled feta and serve.